A wave of endorsements have brought Britain’s most vibrant music scene together with its most left-wing political leader. In 2016, during the attempted coup against his leadership, prominent grime artist Novelist tweeted his support for Jeremy Corbyn. “Don’t resign,” he said, “the mandem need you.” Days later he would join the Labour Party. 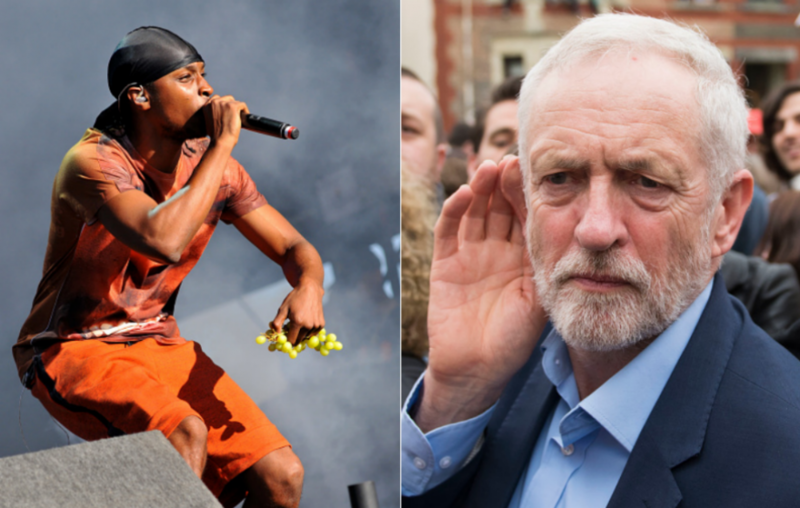 The phenomenon reached its peak in recent days with a fascinating interview between grime royalty JME and Corbyn which spanned a range of political issues from healthcare, housing and education to disillusionment with politics among many young working-class people. Grime’s gravitation to Corbyn has been an intriguing subplot in Labour’s come-from-behind election campaign. To understand its roots and potential significance, you have to pick the genre up from its origins in working-class London. Hip-hop music and culture began to gain a foothold in Britain in the 1980s. The sounds of decaying urban life in black America resonated with the wasteland Thatcherism left behind in many working-class and migrant communities. At first, Britain’s hip-hop scene emulated its American origins. It wasn’t until the mid-‘80s and the emergence of London Posse that a prominent act began rapping in their own accents and with a distinctively British style. The group had formed on a tour of America but, as its leading MC Rodney P reflected, this had made them more aware of their difference as a British act. “In New York, I became very nationalistic,” he would say, “I’m English, I’m not American. I was speaking more cockney.” In 1988 they released Money Mad, a blend of reggae, rap and reflections on life in London that put a sound to the young migrant communities which gave birth to British rap. In the early 90s other new genres of music developed in the UK. Jungle, drum & base, and then UK garage were all faster-paced and more akin to dance music, but in the clubs and on pirate radio they incorporated MCs and the elements of sound system culture that had influenced hip-hop. Jungle was especially dark, reflecting a post-Thatcherite “underclass” life created for black and white urban youth. By the mid-to-late 90s UK garage was the sound of young Britain. A form of dance music that leaned on soul, the vocalists on its records were often singers such as Craig David, Kele La Roc and Shola Ama. The MC was still a part of the culture but their role was to set vibes. The pirate radio scene was still influential, dominated by groups such as Heartless Crew and Pay As You Go. By the new millennium Wiley, the artist widely-heralded as Grime’s godfather, had begun to produce music with a darker edge again. Initially receiving a mixed reception, he would later say that the house and garage scene “didn’t really like what I was doing.” On his single ‘Wot Do U Call It?’ he mocked the idea of his music being called garage and branded it Eski Beat. Dizzee Rascal emerged from Wiley’s Roll Deep crew at this time and became a mainstream success story. The name Grime began to be used to describe the genre. Wiley originally said “I don’t call it grime but other people do. I don’t really want to call it anything… We don’t really have the power to name it. It’s the people that accept it, the radio stations, MTV and all that, who’ll say ‘right, it’s this. '” Over time, that is exactly what happened and the name Grime stuck. Much like how g-funk merged the sounds of Bootsy Collins and George Clinton with hip-hop to create a regional variation of hip-hop that reflected LA, the young MCs and producers who created Grime had merged UK Garage and Jamaican sound system culture with hip-hop to create a sound that was particular to London. Grime reflected the raw energy, anger and emotions of life on the capital’s streets and, as time progressed, those of Britain’s other major cities too. Aggressive basslines and fast-paced rhythms underwrote stories of urban life. For young people growing up on council estates, the UK’s equivalent of ‘the projects’, Grime became their soundtrack. Much like its following among urban youth, Grime lives in constant tension with the police. Pioneering act So Solid Crew saw a tour in 2001 and a festival appearance in 2002 canceled after local police refused to work at the gigs. Eight years later south London rapper Giggs suffered the same fate. This summer’s sensation J Hus has been forced to announce a tour schedule without a date in his native London, an absence widely-believed to be a result of police influence. This repression has been formalised by the infamous 696 form used by London’s metropolitan police. Launched in 2005 in response to a series of violent incidents at gigs in the city, the form solicits performers’ names, addresses and telephone numbers under the guise of “risk assessment”. Initially, it went so far as to ask whether a “particular ethnic group” was likely to attend. This question has since been replaced with a more oblique one about “target audience,” but concerns about racial profiling persist. But, despite the best efforts of the police, grime continued to grow. In 2016 it was classified as its own genre on iTunes. This was followed by Skepta winning a Mercury, the award for best album in the UK in a calendar year. He was also featured on the Billboard topping More Life album by Drake, one of the best-known rappers in the world. The album, which has strong British influence, also features Giggs. Meanwhile, Stormzy’s Gang Signs & Prayer became the first grime album to reach UK number one, selling 70,000 copies in its first week. Grime is finally achieving recognition – but its leading figures haven’t forgot its struggle. For the generation that created grime, electoral politics seemed a distant spectacle. The onslaught of the Margaret Thatcher years produced resistance at first, with London communities like Lambeth fighting back. But the defeats of those years led to resignation and by the following decade Tony Blair’s Labour Party had accepted the fundamentals of Thatcher’s economics. For working-class Britain this meant more cuts, fewer opportunities and, ultimately, a chasm opening up to mainstream politics. By the time the 2000s came around, young people had seen government by both the Tories and New Labour. Thirty years of free-market attacks on the welfare state meant few had any relationship to the glories of Labour’s post-war years. Instead, most related to Labour through Tony Blair, and particularly his march towards war in Iraq. The Iraq War, and the mass protest movement against it, injected some political energy into Britain’s urban youth. This was reflected in the hip-hop scene too, with the emergence of rappers such as Lowkey, a young Londoner of Iraqi descent. His politically-charged lyrics raged against politics at home and war abroad, articulating the experience of young Muslims in Britain as well as finding solidarity with the struggle of those bearing the brunt of the west’s wars in the Middle East. “In this country the first enslaved were the working-class, what’s changed? But, ultimately, electoral politics offered few channels to articulate this resistance. It was around the same time, the Iraq War years, that grime emerged on the pirate radio stations of east London. The charismatic MC and producer Wiley is widely-regarded as its first major influence, and his protege Dizzee Rascal became its first big star, winning the Mercury Prize the year the Iraq War began in 2003. Grime wasn’t a political genre but the narrative set by its themes had socio-political relevance. The MCs were young people channeling their anger at the system into music that injected rebellion into popular culture. Explicitly political content would appear at times. Dizzee Rascal’s famous line – “I’m a problem for Anthony Blair” – on his 2003 debut demonstrated the scene’s disconnect with electoral politics while also taking a political stance of its own. Hostility to Blair and his anti-social behaviour orders (ASBOs) was a running theme. Roll Deep’s song ‘Badman’ was created to support a ‘Stop The Guns’ campaign in 2006. The following year Bashy released ‘Black Boys’, an inspirational song that challenged stereotypes and celebrated black role models. Grime’s initial success was fleeting, “a rebellious yelp from those excluded from New Labour’s millennial optimism” as music journalist Dan Hancox put it in a recent piece. But if the genre’s first breakthrough might have made it appear more fad than phenomenon, its abrasive style was to find even more resonance in a Britain of crisis and austerity. No moment defined the disillusionment with the political system and the anger against social conditions among working-class, and particularly black, communities in London more than 2011’s riots. Police shot dead Mark Duggan in August of that year, sparking protests first in north-east London and then across the city and country. Duggan had been a friend to a number of grime MCs in the area, even appearing in a Skepta video. But his death was more than a personal tragedy, it spoke to longstanding problems of police violence in Britain’s poorer urban neighbourhoods. For the family of local grime artist Scorcher it was a painful recurrence: 25 years earlier his grandmother Cynthia Jarrett had died of a stroke during a police raid, sparking the Broadwater Farm Riots. Labour’s response to the London riots spoke to the party’s distance from the sentiment of the young and working-class. During the Broadwater riots in the 1980s its MP, the late Bernie Grant, had been widely-criticized for saying the police had got “a bloody good hiding”. But by 2011 its local MP in Tottenham, David Lammy, called the riots a “disgrace,” saying they had “ripped the heart out of the community,” and dubbing those who participated “mindless” and outside agitators. Lammy would later go on to say a ban on smacking children had contributed to the riots, and his book on the subject would consistently focus on cultural explanations such as inadequate parental guidance, poor role models and insufficient education. When he did give credence to economic arguments about the impact of free-market reforms they were warped into narratives about rampant individualism that meant young people didn’t have a “stake” in society. As Labour leader, Jeremy Corbyn has been much less shy about focusing on economic arguments and solutions to London’s problems. Housing has been central to his offer, with a proposal for the construction of 60,000 council houses a year in the city, and tellingly this was the first theme he raised in his interview with JME. So, what does all this mean for Corbyn’s Labour as it faces into a general election on June 8th? Despite a recent recovery in the polls – gaining eight points in a month – they still trail by some distance heading into the final weeks. Even if Labour don’t win the election, however, Corbyn stands a decent chance of beating the results of his predecessors Miliband in 2015, Brown in 2010 and possibly even Blair in 2005. Such an outcome might just keep the radical politics he represents, and that many young grime artists feel represents them, alive in the Labour Party and British politics more generally. If this is to happen, Labour will need high turnout among young, working-class and migrant communities, particularly in Britain’s cities. In the last general election only 43% of people under 25 voted, compared to 78% of over 65s. The 56% turnout among black and minority ethnic voters was also well down on the 66% average. Both C2 and DE categories also turned out in low numbers, while three-quarters of the wealthiest voters went to the polls. Grime4Corbyn has made big efforts in recent weeks to encourage people to register to vote. Non-partisan campaigns such as Rize Up have been launched as well with support from Professor Green, Mavrick Saber, Doc Brown and other artists, targeting youth registration. There are also plans for a get-out-the-vote rave before the election. In the end, it is likely to come down to the degree to which Corbyn’s policies gain traction. Ending tuition fees and zero hour contracts, increasing the minimum wage and tackling sky-high rents, free childcare and proper public transport – it’s a transformational offer for young people, and one that his supporters in Momentum will spend weeks trying to get across.